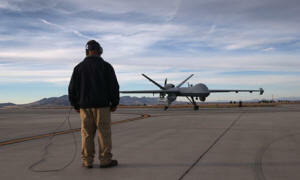 Home > Asia > US drone strikes more deadly to Afghan civilians than manned aircraft, adviser says. Study focusing on one year of conflict contradicts claims that robotic planes are more precise than manned counterparts. US drone strikes more deadly to Afghan civilians than manned aircraft, adviser says. Study focusing on one year of conflict contradicts claims that robotic planes are more precise than manned counterparts. A study conducted by a US military adviser has found that drone strikes in Afghanistan during a year of the protracted conflict caused 10 times more civilian casualties than strikes by manned fighter aircraft.